This is the third of three in a series on Cocktail Science. Read part one, The Theory of Natural Cocktail Selection, and part two, On Shaken Cocktails. Second, and more interestingly, was the relationship between ethanol, sugar and acid. As it turns out, there was no significant relationship to be found between ethanol and acid (or in a multivariate analysis between the three). However, if I combined ethanol and sugar into a single variable and analyzed that against acid, I discovered a critical insight: At relatively low and relatively high acid contents, too much ethanol is not generally desirable. 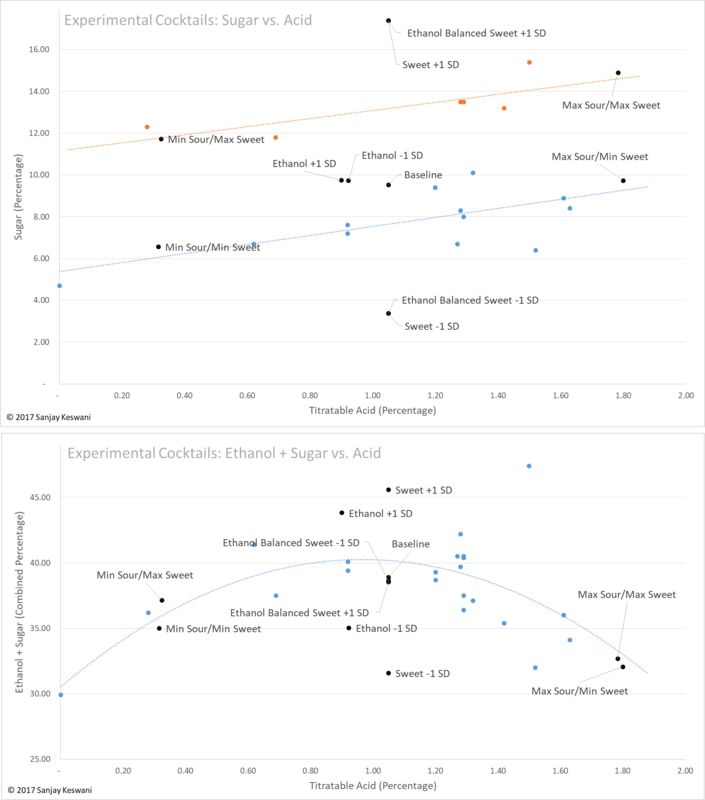 Taken together, these two charts tell us that for any given acid concentration, there is a relatively small range of sugar that tastes delicious and a specified amount of ethanol that is ideal. You might say that these are the two general contentions of the model. To be sure, the fit of the individual components of the model (as measured by the statistical coefficient of determination, R2) was extraordinarily high (ranging between about 0.37 and 0.59), so it appears that this is quite a bit better than reading tea leaves to say the least. What these two charts represent, however, is not merely explanatory. It’s also predictive as I will show below. What I mean by that is that they can guide and streamline new cocktail development to take much of the guess work, hunches and intuition out of the process. The model can basically predict what formulation of ingredients will be delicious for most people and it’s extremely accurate. If you have an idea for pairing particular flavors together in a cocktail, all you have to do, in theory, is approximately know the ethanol, acid and sugar contents of the ingredients you’re working with and punch them into the model. As you’ll see based on my experiments, certain sections of the Classics Corridor lend themselves better to specific kinds of cocktails. For example, if you want to add delicate, soft floral herbal tea flavors to a cocktail, there is a section of the model you should aim for. Looking to add egg whites for a frothy delight? There is a section of the model for you too. Classic sour on your mind using unusual citrus and other ingredients? The model has you covered. Is the cocktail predicted by the model indeed appropriately balanced and delicious? What is the character of cocktails produced by the various sections of the model? All measures must be in increments of 2.5 mL. All cocktails must be between 90 mL and 100 mL. I decided to set up a Baseline cocktail roughly in the center of the model as a control, basically, a classic gin sour. From there I would have the model create cocktails based on the above specified rules for each quadrant of the Classics Corridor. Top left would be minimized acid and maximized sugar, top right would be maximized acid and maximized sugar, bottom right would be maximized acid and minimized sugar and bottom left would minimized acid and minimized sugar. All the while, the model would balance ethanol based on the ideal specifications. In addition to this, I thought to test six cocktails not created by the model which intentionally violated the boundaries of the model in specific ways, basically, intentionally imbalanced cocktails. 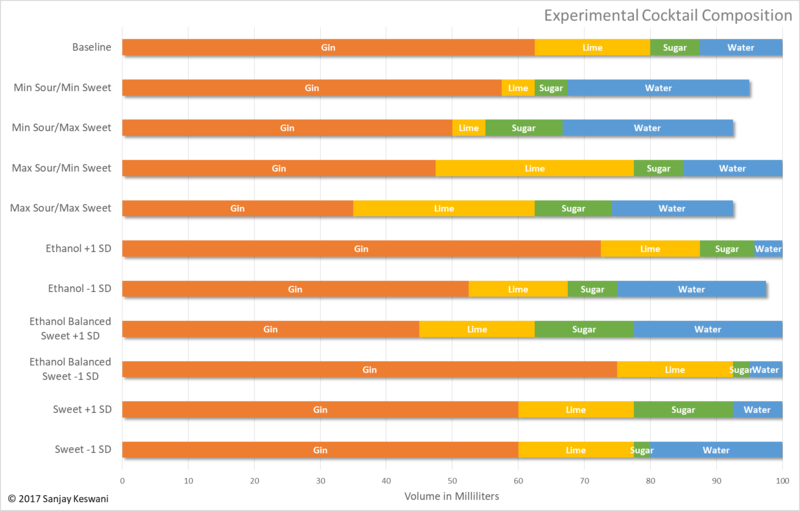 I used two sets of cocktails to test, respectively, ethanol and sugar about one standard deviation from the model’s upper and lower bounds (while keeping other characteristics balanced), and one set of cocktails to vary the sugar while not rebalancing other characteristics. Baseline – A control cocktail that sits roughly in the center of the model, with characteristics that are approximately an average of the classic cocktails used to construct the model. Min Sour/Max Sweet, Max Sour/Max Sweet, Max Sour/Min Sweet, Min Sour/Min Sweet – Four cocktails intended to probe the most extreme edges of the model to test whether the cocktails produced in these area were still conventionally balanced and the nature of such cocktails. Ethanol +1 SD, Ethanol -1 SD – Cocktails not produced by the model with balanced sugar and acid content, but ethanol, respectively, one standard deviation above the upper bound of the model and one standard deviation below the lower bound of the model. This set of cocktails tests the tolerance for ethanol outside the ideal quantity predicted by the model. Ethanol Balanced Sweet +1 SD, Ethanol Balanced Sweet -1 SD – Cocktails not produced by the model with a standardized acid content and ideal ethanol content, but sugar content, respectively, one standard deviation above the upper bound of the model and one standard deviation below the lower bound of the model. This set of cocktails tests the tolerance for sugar outside the Classics Corridor, keeping ethanol balanced. 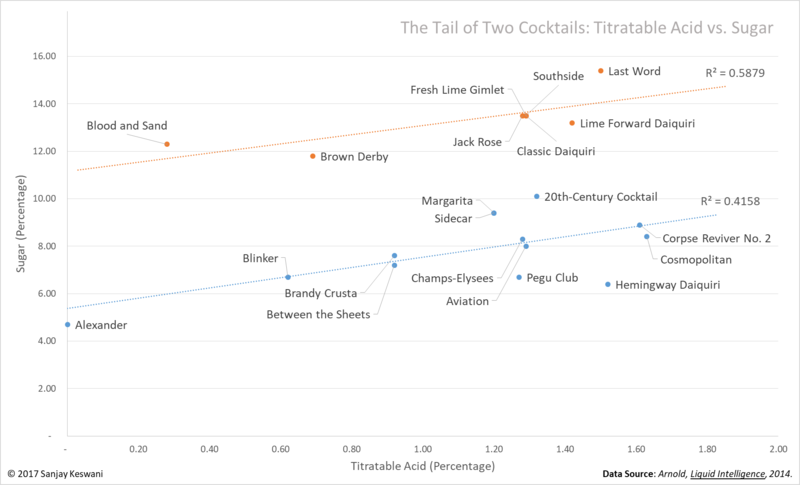 Sweet +1 SD, Sweet -1 SD – Cocktails not produced by the model with a standardized acid and ethanol content and sugar content, respectively, one standard deviation above the upper bound of the model and one standard deviation below the lower bound of the model. 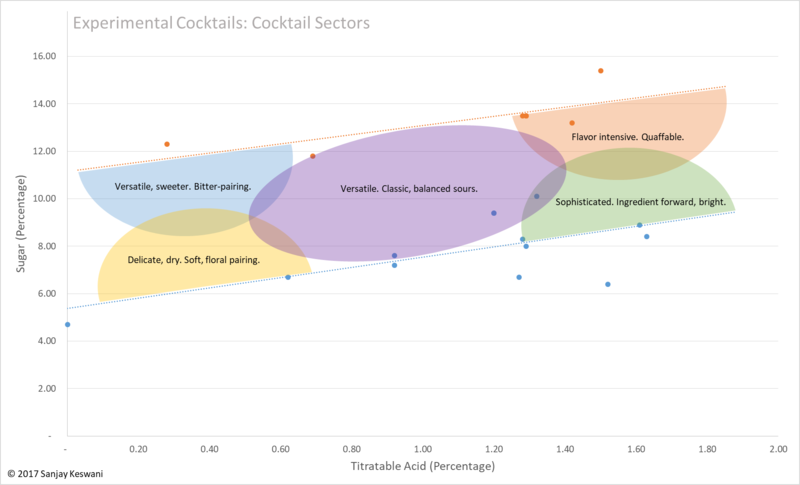 This set of cocktails tests the tolerance for sugar outside the Classics Corridor without balancing ethanol. As you can see above, the intentionally imbalanced cocktails test specific areas of the model for weakness. Ethanol +1/-1 SD tests the usefulness of the ideal ethanol contention of the model; Ethanol Balanced Sweet +/-1 SD tests the usefulness of the concept of the Classics Corridor; Sweet +/-1 SD tests both contentions simultaneously. Note that the sugar and water above do not include amounts already included in the volume for gin and lime juice, but only added sugar and water as prescribed by the model before shaking ice dilution (which will increase the amount of water in the end product). 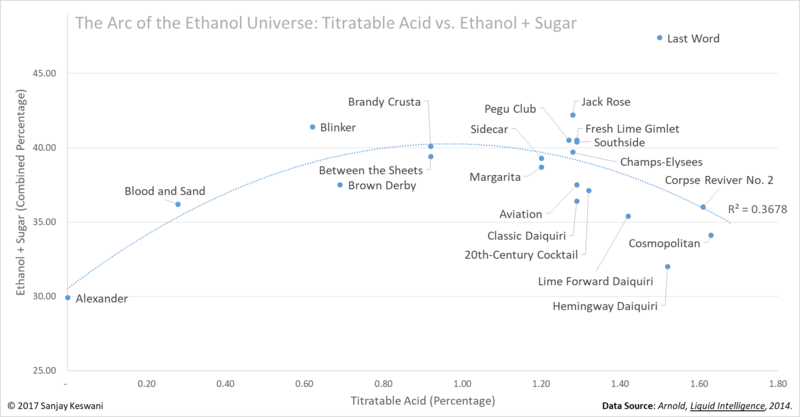 I suspect that Ethanol +1/-1 SD will each taste out of balance but not entirely undrinkable, whereas Ethanol Balanced Sweet +/-1 SD will each be entirely undrinkable and Sweet +/-1 SD will each be barely recognizable as a cocktails. Min Sour/Min Sweet – Gin forward and dry with subtle lime notes. Overall, tasted balanced and delicious, with light flavor intensity. Remarkably, does not taste overly boozy. Water content in cocktail could be substituted with a soft, floral herbal tea to stunning affect. Beautiful and delicate. Min Sour/Max Sweet – Subdued lime comes across like an entirely different variety of citrus, similar to Thai sweet lime. Sugar is surprisingly balanced, not in the least confectionery and quite sophisticated. Water content of cocktail could be substituted with twice brewed green or black tea or, with a different base spirit like rum or whiskey, even coffee. Extremely versatile. Max Sour/Min Sweet – Beautifully lime forward. Fresh citrus explodes with flavor but the acid is surprisingly not overwhelming, but entirely balanced. This would be a prime candidate to highlight unusual individual citrus varietals, blend multiple ones or combine with aromatics like basil, parsley, cilantro or celery juice for brilliant green brightness. A triumph. Max Sour/Max Sweet – Flavor intensive but balanced, this is an easy drinking cocktail with little or no indication of ethanol content on the palate. Water could be substituted with egg white for foamy fun. Great crowd-pleaser and extremely quaffable. The cocktails not designed by the model, but rather to probe the space around it, were rather shocking as well. Not only were they bad, but many were strangely terrible. 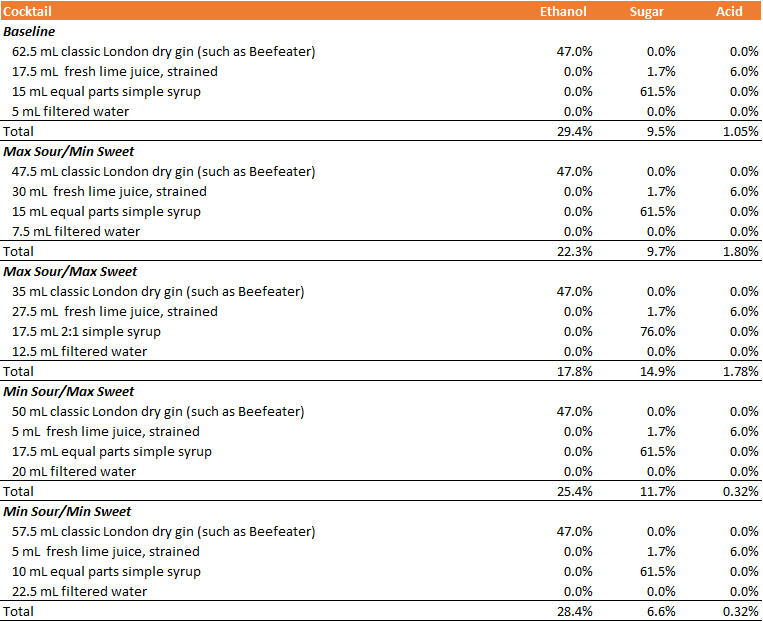 In some cases, off flavors were highlighted in the gin (e.g., Ethanol +1 SD), in others the flavor intensity was mute (e.g., Ethanol Balanced Sweet +1 SD) and others were simply undrinkable (e.g., Sweet +1 SD). I won’t bore you with why each of the test cases didn’t work and how, but sufficed to say, none were balanced and none worked as cocktails. The wisdom of classics is actually deeper than I could have predicted. Interestingly, these sectors don’t always explain the classics cocktails that fall within their boundaries. I would suggest that this is due to a sort of averaging of the collective taste wisdom imparted by all of the classics, taken together. With that, it’s time for you to try out these cocktails yourself. Unfortunately, to make the cocktails as precisely as required, you’ll need a set of graduated cylinders. Classic jiggers are just too imprecise. You’re welcome to round these off as best you can, but you may not get exactly the same results as I did above. Keep that in mind. In general, I don’t recommend using 2:1 simple syrup because it’s too thick and slow pouring to be workable in cocktails. In the case of one of the cocktails above (that is, Max Sour/Max Sweet), however, I needed to use this style of syrup to precisely dial in the exact sweetness level within measuring constraints. You may substitute equal parts simple syrup in Max Sour/Max Sweet at about 20 mL for slightly less sweet or 22.5 for slightly more sweet than the prescribed recipe. Note that I recommend you fully use any 2:1 simple syrup within one month, rather than two weeks for conventional simple syrup, as the former is less prone to spoilage.